The theme this week on I Heart Faces is Best Face Photo in January. This was Jude running around outside on New Year's day. 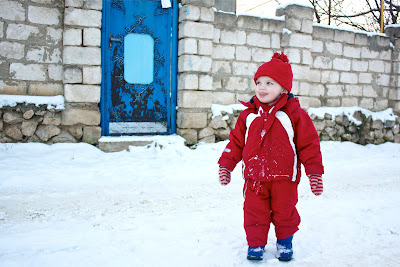 I just never can get enough of his bright red snow suit and blue boots against the white snow, and i love the sweet little look on his face. Oh he is just too cute with that little tongue out! P.S. I love his name too! If we have another boy, we plan to name him Jude Robert!